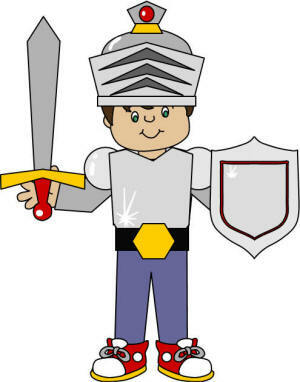 In biblical times soldiers would wear very heavy armor. In fact, when David went to fight the giant Goliath he couldn't wear the armor because it was too heavy. These days, soldiers don't wear armor, but you might find it interesting to know that many Christians wear armor everyday and it would be a good idea if you did too. How can you wear armor? This armor is so neat; it's like having special powers that are invisible! When you imagine yourself putting on the armor of God each day it will help you against the devil as well as the things you shouldn't do. However, the only way this armor will work is if Jesus lives inside you. The devil wants us to mess up and do things God doesn't want us to do. He might try to do that by getting you interested in violent video games, shows on TV or movies that show people doing things that are sinful and try to make them look like fun. You might also be pressured by other kids to do things that we know God wouldn't want us to do. These are some of the ways that the devil tries to trick you into doing things you shouldn't (this is called sin). By putting on the armor of God, you will be able to stand up to these things and do what is right. The armor will give you God's help to fight against the bad in the world. We are going to start with the Belt of Truth. We need to put this on first to be truthful and remember the truth we know about God. We can know the truth by reading the Bible, the Spirit telling us (giving us a conscience), or learning from other people who believe in God the same as us. Next is the Breastplate of Righteousness. If you play hockey you probably have something that protects the part between your neck and tummy. This piece also protects your heart. We can protect our heart by confessing any sin we have, or saying sorry to God for things we've done wrong. Now we put on the Sandals of Peace. First, we need to protect our feet and go where God would want us to go. Our feet would get sore if we walked around with no shoes on, so we need to avoid places we know we shouldn't go to keep our protective sandals on. Second, we need to be peaceful with others. If there is someone you're fighting with or if you've hurt someone's feelings you need to go ask for their forgiveness, or forgive those who have wronged you. Third, if you find things are a little hectic God is the peacemaker, and if you ask He can give you all the peace you need. The next piece of armor you don't have to wear; instead, you hold it. It's the Shield of Faith. Just think of what you could do with a real shield. If someone throws a snowball at you, you can lift the shield so it doesn't hit you at all. We can use the shield in the same way when bad things come our way like temptations or doubt. Sometimes the devil will try to make us think that there isn't a God, or that he doesn't love us because we've done something wrong. We need to hold up our shield and stop these thoughts when this happens and remember that God loves us no matter what. The Helmet of Salvation is the next piece. This is what we use to protect our minds. Sometimes we need to remember that we're God's children and He loves us and will help us. We also need to remember what we've read in the Bible and learned from our parents and church about God. That will help us make the right decisions. The next piece of armor that we hold is the Sword of the Spirit. The sword is both the Bible and having the Spirit of God work in us. We can cut anything off that isn't good in our lives. By remembering God's word (the Bible) we will be able to tell what is good and what is bad. Prayer is the last piece of armor. This isn't a particular piece of armor but kind of holds all our armor together. By talking to God we can do amazing things. Nothing is too big or impossible with prayer because God can do anything that He wants to. That doesn't mean that he will always answer the way we want him to, but he will answer the way He knows is best. When we pray, we need to remember that we don't always need to ask for things. God also wants us to pray for others (for people that don't know Him, for people we don't like, for people that are sick, etc.). He also wants us to thank Him for whatever we are thankful for (being good at something, family, friends, toys, etc.) He blesses us with these things so we should thank Him. A good way to help you remember the armor is to put it on each day when you get out of bed or before you go to school. Pray that God will help you remember that the armor is there and what it's used for so you can fight the bad with the good.